Dollhouses make the perfect holiday gift! Dollhouses have been a long standing traditional holiday gifts for both children and collectors since the beginning of time. For over 70 years, Greenleaf has been providing that special gift you're looking for that will make this holiday season memorable. Visit our company store for a selection of exclusive offerings including many new dollhouses to build that are not featured for sale on our main site. Additionally, Greenleaf is offering FREE SHIPPING on orders over $49 on all of our dollhouse kits and dollhouse accessories. Greenleaf Dollhouses gets a makeover! Greenleaf Opens Its Company Store! Greenleaf Dollhouses is now making our products available to consumers directly from our website. This new development came by requests from many of you who do not have a local miniature dealer convenient to your location. Though Greenleaf always urges you to shop close to home, we understand the need to have this convenience available to those of you who would like to buy factory direct. This also presents an opportunity for us to move forward on a long-time desire to produce Limited Edition Dollhouses that will be available exclusively though our website. These houses will be variations of your favorite Greenleaf Dollhouse that will be manufactured in small quantities often on a one time basis. Please be sure to check our dollhouse store regularly to see what will be available. Greenleaf Dollhouses knows what miniaturists want! What makes our dollhouse kits so popular? The answer is a combination of factors: Exceptional design; affordable prices; a large selection of dollhouses and dollhouse furniture that children, adults and miniature enthusiasts can all enjoy; and quality wooden dollhouse construction. We've been making dollhouses for over 50 years and are acknowledged by many to have the best designs in the entire miniatures industry. Our dollhouse and craft kit instructions are clear and well illustrated, dollhouse assembly requires no nails or tools, and there is a "Satisfaction Guaranteed" warranty in every dollhouse kit we sell. You'll feel right at home from the moment you open the box! 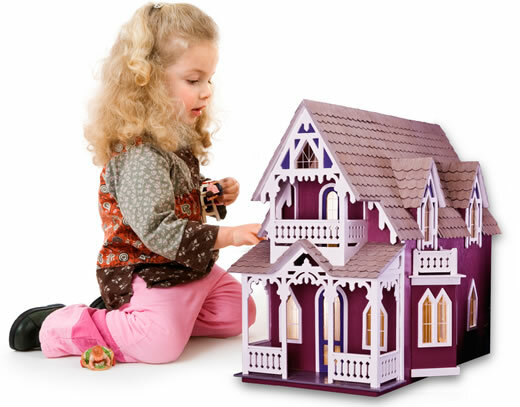 As a retailer, the best reason to carry Greenleaf Dollhouses is because they sell. That is why Greenleaf is the largest manufacturer of dollhouses in the world. Our dollhouses and craft projects are sold in thousands of shops across the USA and Canada, in numerous European countries, and in places as far away as Australia and Japan. If you are a consumer interested in purchasing Greenleaf Dollhouse kit, check out our dealer locater to find the Greenleaf Dollhouse store nearest to you or visit our new store to buy dollhouses online factory direct. A Greenleaf wooden dollhouse kit is the perfect family project, a perfect family keepsake and perfect for the miniatures collectors. Look around our site and check out our many dollhouse designs and also visit Corona Concepts for more choices in dollhouse kits and dollhouse furniture and other craft kits.